Just remove iCompta from the Applications folder. You might as well want to remove the preferences file com.angeman.iCompta.plist which is in your Preferences folder. You can remove an account by clicking on the '-' button. It will let you edit its name, its icon, its currency and its original balance. 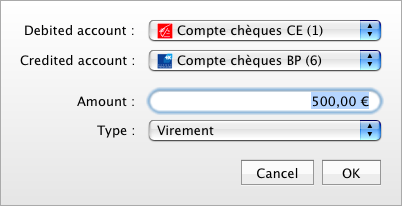 The first value right to the name of an account indicates the real balance of the account and the second one indicates the bank balance (only the validated operations are considered). You can transfer funds between two accounts by clicking on the transfer button. It will automatically create two transfer operations in the selected accounts with the desired type. 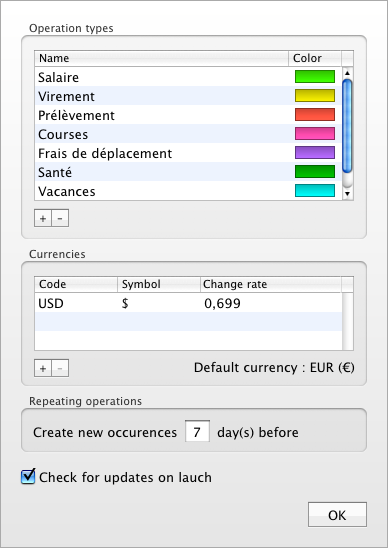 You can click on the import button to replace the operations of each selected account with the ones from a file. iCompta TSV : iCompta tab separated text file. You can click on the export button to export the operations of each selected account to a file. Clean operations : you can remove operations older than a certain number of months. You can create a new operation by clicking on the '+' button. You can remove an operation by clicking on the '-' button. You can move operations in an other account by dragging them onto the new account. If you maintain the option key while dragging, the operations will be duplicated instead of moved. You can edit an operation directly by double-clicking on the field you want to edit or by selecting the desired item in case of the operation type or frequency. The checkbox on the right is used for validating operations that are on your bank reports. You can click the actions button to open the operations action menu. Set operation type : you can modify the operation of several operations with this action. Show next occurrence : you can force the creation of the new occurrence of a repeating operation. You can filter operations by date (enter a month and a year in the search field with a MM/YY format), type or description or you can choose to display only your incomes or your expenses. You can show statistics by clicking on the appropriate button. 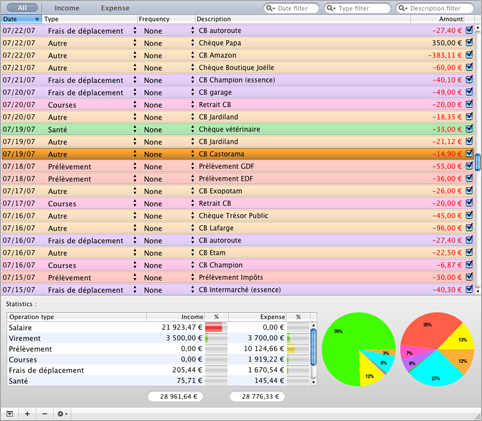 It will display the part of each operation type in your global incomes or expenses as a table and a pie diagram. You can create a new operation type by clicking on the '+' button. You can remove an operation type by clicking on the '-' button. You can edit an operation type name directly by double-clicking on the name field and you can edit an operation type color by clicking on it. You can create a new currency type by clicking on the '+' button. You can remove a currency type by clicking on the '-' button. New occurrences of repeating operations are automatically created as the new occurrence date approaches. You can set the number of days before the date of the next operation to use for creating new occurrences.